This era has been ruled by mass production and instantaneous service, and the fashion industry has not been spared by this trend. Fast fashion has been the way to go, with brands like H&M, Zara and Topshop leading the pack. But bucking the trend is the label 'Time Taken to Make a Dress'. The label focuses on the technicalities of dress-making while also maintaining the artistry of designing clothes for women. On Saturday, when thefword visited the exhibition by the designers, Jade and Letitia, we managed to speak to one half of the duo behind the label, Jade. Dress-making, as Jade feels, is a dying trade in Singapore. Perhaps its the amount of time spent or the tediousness that goes into making a single piece of garment, but there are just very few dress-makers in the younger generation. The beauty of dress-making is that it results in artisan grade pieces that fit the individual it is made for perfectly. Yet many of us fail to appreciate that bespoke garments are usually of a higher quality than normal ready to wear or off the rack pieces. And bespoke garments, like humans, are unique, possessing a certain personality and soul that cannot be found in garments that have been mass produced in the factory. When I asked what the label's signature style was, Jade mentioned that there wasn't any, simply because 'Time Taken to Make a Dress' offers a unique service of customizing pieces for every client. In short, the client is their muse, and the designers will work with the client to create something to suit their personality. Their collections serve as an inspiration for their clients, who might use a piece in the collection as a starting point for creating their own dress. Other than that, 'Time Taken to Make a Dress' provides services like creating a dream dress for their client who already has some ideas in mind. Clients can also bring in a dress of their own to be reconstructed. While such services may seem to limit the business opportunities for the label, Jade has no fear about tapping into this niche area as she feels that consumers are becoming more discerning and the age group of the clientele will not be limited by this exclusivity (they've had a customer as young as 12 years of age to one who was 64 years old). Each piece in the collection is also a collaborative work by the designers. Describing how they work together, Jade says that while both Letitia and herself have very different tastes and aesthetics, but both of them are always drawn to a similar design or pattern for different reasons. Their differences are also complementary, helping them to take their ideas one step further. And perhaps the similarity they share the most, is their quest for perfection. Jade mentions that they're always editing and improving a piece of work, even when it comes down to the last minute. I think that 'Time Taken to Make a Dress' has something going for them. 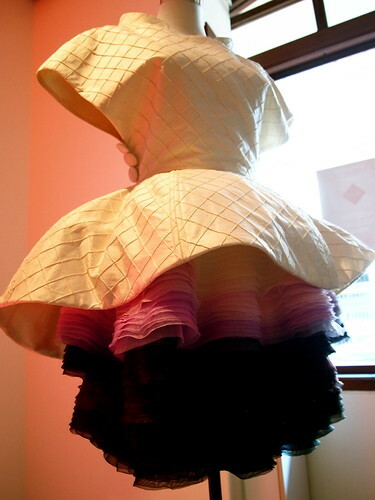 And I hope they'll pave the way for more consumers and designers to appreciate the time taken to make a dress.